Aston Villa came from behind to beat nine-man Litex Lovech in the Uefa Cup. Litex shocked the visitors when Ivelin Popov curled in a free-kick but keeper Uros Golubovic gifted Villa a leveller. Golubovic missed an attempted clearance and Nigel Reo-Coker slotted in before Cedric Cambon was sent-off for the home side for two bookable offences. Mihail Venkov was then red-carded for handball and Gareth Barry, on his 400th Villa outing, scored from the spot before Stiliyan Petrov's late goal. The win flattered a Villa side who found the going tough in Bulgaria. They had made a lethargic start that gave their hosts extra encouragement and Litex took advantage by going ahead after 10 minutes. Reo-Coker conceded a dubious free-kick just outside the Villa area and Popov curled a shot past Friedel, who appeared to have been put off by Stanislav Manolev jumping to head the ball. The goal gave Litex even more belief and, unlike their opponents, they displayed purpose and energy going forward. The visitors opted for a five-man midfield with winger Ashley Young and towering forward John Carew out injured, but lone striker Gabriel Agbonlahor was an isolated presence up front. Barry did head in a James Milner cross for the visitors only for his effort to be ruled out for offside before Villa survived a massive scare. Wilfried Niflore was put through on goal and he rounded Friedel but - with the angle against him - he shot into the side-netting. It proved a vital miss as Litex keeper Golubovic immediately gifted Villa a leveller by kicking thin air rather than the ball on the edge of his area and leaving Reo-Coker to slot in. The equaliser was more than Villa deserved and Litex did not help their cause in the second half when Cambon hauled down Agbonlahor for a second yellow card. Venkov soon followed as he blatantly swatted the ball off the line after unconvincing keeper Golubovic failed to punch away a cross. Barry confidently slotted in the resultant penalty and Villa then had little trouble to secure the win. Petrov gave the scoreline a more emphatic look when he scored at the second attempt after his initial shot had been saved. "It was a very sluggish start. We did the one thing we didn't want to and gave away an early goal. "It took a long time for us to get into our stride. "But the equalising goal gave us such an advantage. That basically changed the whole impetus of the game." Litex Lovech: Golubovic, Cambon, Venkov, Nikolov, Berberovic, Manolev (Acedo 75), Popov, Wellington (Angelov 85), Dudu (Barthe 62), Niflore, Sandrinho. Subs Not Used: Todorov, Dos Santos, Bibishkov, Tsvetanov. Sent Off: Cambon (60), Venkov (71). Aston Villa: Friedel, Luke Young, Cuellar, Laursen, Shorey, Gardner (Harewood 68), Barry (Salifou 78), Reo-Coker (Routledge 74), Petrov, Milner, Agbonlahor. Subs Not Used: Guzan, Knight, Osbourne, Delfouneso. Goals: Reo-Coker 45, Barry 72 pen, Petrov 90. 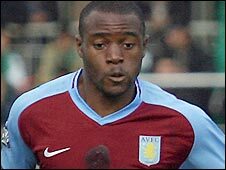 BBC Sport Player Rater man of the match: Aston Villa's Nigel Reo-Coker on 5.21 after 90 minutes.